I connect even more with this than with the sunset, I think. 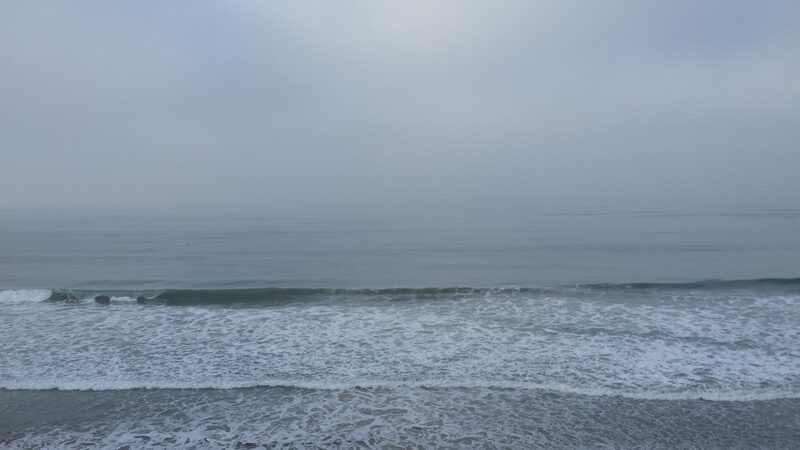 I love the moodiness, I love being protected, bundled up in the wind; I love the near flatness of the color, the narrowness of the beach at high tide, the all-oneness of sky, water, sand, and the elemental feel that speaks of vastness, mystery beyond comprehension of a mere photograph. The receding waters make clacking sounds — like a stick drawn across a picket fence — over the smooth pebbles that are brought in to prevent beach erosion. What a lovely side effect! It wasn’t audible with every wave. There must have to be the just the right depth and density of pebbles and the right amount and speed of water. I’d never heard this before. Gift.